TP Mazembe of DR Congo defeated Heartland of Nigeria 1-0 in Lubumbashi on Saturday to win their third Champions League trophy. The home side clinched their third continental title on away goals after losing the first leg 2-1 last week. Heartland held out for 73 minutes before Cameroonian midfielder Narcisse Ekanga scored to bring the trophy back to copper-rich southern Congo. Apart from the prize money of US$1.5m, Mazembe qualify for the end-of-year Fifa Club World Cup in the UAE with Spanish giants Barcelona among possible opponents. Heartland seemed to be grinding out the draw that they needed, but wave after wave of attack finally resulted in the Mazembe goal. As expected, Mazembe attacked from the start, but the first real chance came to Heartland, with striker Emeka Nwanna shooting wide from inside the box on 14 minutes. The hosts almost took the lead in first-half stoppage time, but a glancing header from Dioko Kaluyituka was pushed onto the post by Heartland goalkeeper Augustin Brown. Time seemed to be running out for Mazembe, but the goal finally came through Ekanga, who finished off a scrappy move by heading in from close range. Mazembe then pressed forward for a second, and there was no way back for the Nigerians. 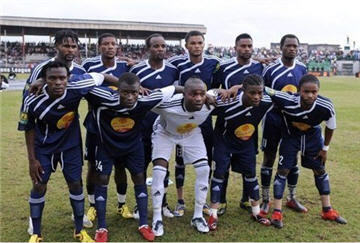 Heartland ended the game with ten men, with striker Emeka Nwanna send off for a lunge at an opponent on 90 minutes. "Hard work is what was needed in this team, this is what is really lacking in this city of Lubumbashi," said Mazembe's French coach Diego Garzitto. "If you work hard there will be a result, you can't be sitting down saying things will come from God." The game was watched by President Joseph Kabila, and the victory is the culmination of a rebuilding process financed by club president and governor of mineral-rich Katanga Province Moise Katumbi. Katumbi put in US$5m to win the US$1.5m prize-money, but realising his dream makes it worth it, as Mazembe can now look forward to the Club World Cup in December. Heartland coach Kelechi Emeteole said that it was painful to lose the tie by virtue of conceding an away goal. "It's a very, very hard way to lose out. My happiness is that we were not disgraced, this was our first experience of the competition and we'll be back to play next season," he told BBC Sport. "The match was tough, it was a very good final for Africa, we've been able to show that African football is progressing."